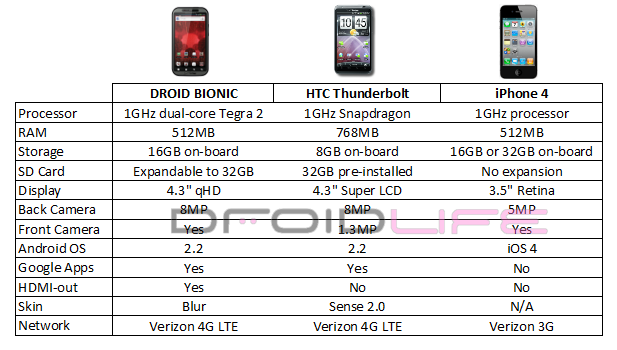 We just wanted to toss this chart out there to give you an idea of how to compare the i*hone 4 on Verizon to the top 4G LTE devices (DROID BIONIC and HTC Thunderbolt) that we should be seeing in just a few months. Other than the fact that the i*hone won’t and can’t run on the new 4G LTE network from Big Red, there are some other big differences here that you should be focused on. Actually, I’m not sure any are bigger than that fact, but we’ll continue on anyway. Screen size: How could you not want one of the new screens that Motorola or HTC are putting out? Super LCD and qHD might be two of the prettiest displays we’ve ever seen and take up almost an extra inch of real estate when compared to Apple’s current offering. Storage: With the i*hone, you are stuck with either 16GB or 32GB. There is no room for expansion on their devices. So if you go with the cheaper $199 16GB model and realize that’s not enough space for all your pr0n, then that’s just too bad. With the Android options above, you get the choice of going all the way up to either 40GB or 48GB depending on the device. Processor: The DROID BIONIC is the only device of the three that sports the new dual-core Tegra 2 processor from NVIDIA. Apple’s doesn’t have one and we’re actually not sure that any of their products ever will. Remember, they like to keep it in house and NVIDIA has already been spreading word of their Android support. HDMI-out: The BIONIC again is the only one of the 3 with this feature. Who doesn’t want to have the option to connect their phone to their TV and show off those beautiful photos and videos they’ve taken to their friends? RAM: The Thunderbolt is the class leader on this one. According to their official spec page, it’ll sport 768MB of RAM which will help make up for the lack of a dual-core processor. Of course, it’s already running the newest Snapdragon, so peformance wasn’t going to be an issue anyway. So, are you still willing to use that upgrade on a device that doesn’t really compare to the top two Verizon 4G LTE devices? While we haven’t heard specific dates for either the BIONIC or Thunderbolt, we have been told “first half of 2011” and have at least a couple of tips pointing for a March release of at least one of them. That’s only a month after the i*hone 4 hits VZW store shelves, can you wait another month? You should.